Former Rep. John Delaney smiles a lot, considering that he was the first Democrat to enter the race for president and that after campaigning for 20 months he is barely a blip in the polls. He smiles, not in an unctuous Howard Dean way, but in the eager manner of a man unafraid of questions and excited to answer them. In a 35-minute interview with Yahoo News, he outlined a full slate of policy ideas: the future potential and pitfalls of technology as it relates to national security, climate change and jobs. He didn’t flinch at questions about the autonomous-weapons race with China, regulation of Big Tech and whether the looming deficit or poverty is a more urgent issue (he said poverty). 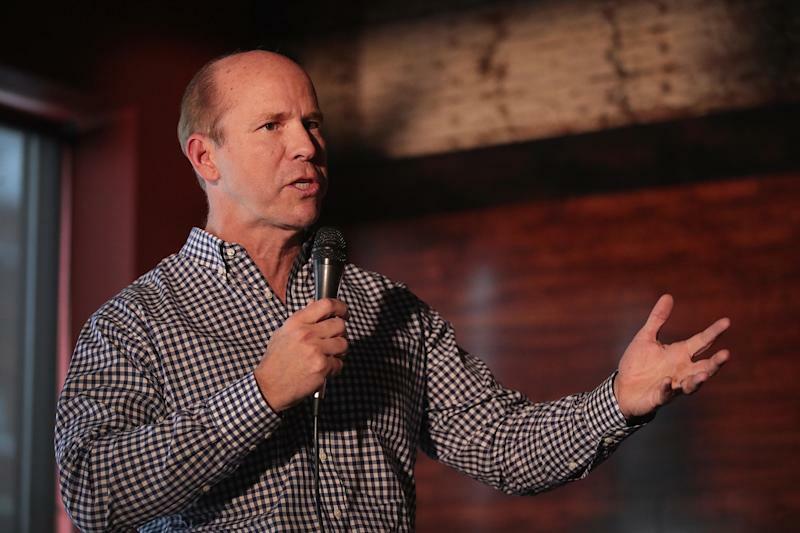 Delaney believes many of his policy proposals could win support from moderate Republicans, and he has hammered home the need for bipartisanship to achieve solutions to the nation’s greatest problems. But he has something else going for him in the race besides his policy expertise. Delaney appears to be positioning himself to run as the Democrat who best embodies the rank-and-file’s rage at Donald Trump. Delaney’s demeanor changed when he talked about the president, whom he called “utterly petty” for his recent attacks on the late Sen. John McCain. The son of a working-class New Jersey family, Delaney, 55, clearly can envision himself on the debate stage against Trump, and he is eager for the fight. Delaney describes his rise from blue collar roots to millionaire status as the classic American dream. Neither of his parents went to college, and it was a scholarship from his father’s labor union that helped fund Delaney’s attendance at Columbia University. After earning a law degree from Georgetown and briefly practicing law, he went into the world of finance and founded two companies -- the first, a lender to health care companies, and the second a lender to small and medium-size businesses. “The only thing my dad helped me do was carry in the furniture,” he said about the help he received when starting his first company. In 2012 he gave up his business career and ran for Congress in Maryland’s Sixth District, a gerrymandered swath that includes more conservative western Maryland as well as the liberal and wealthy Washington suburbs of Montgomery County. He served three terms, but gave up his seat to run for president. Delaney’s background stands in stark contrast to Trump, the son of a wealthy real estate developer who a New York Times investigation revealed was given $413 million over his lifetime by his father. Delaney may not be the loudest person in the room, but he says he wouldn’t hesitate to punch back if he’s given the opportunity to run against Trump. There’s no reason to doubt Delaney’s sincere disdain for Trump, but his new emphasis may reflect a reality about the 2020 Democratic race: After 20 months of campaigning on policy issues with little support to show for it, Delaney needs a new tack. His task now will be to convince Democratic voters not just how different he is from Trump — but that he is the one who can beat him.